“When I was in college, I worked and paid my way through school myself!” You’ve probably heard this saying before. Twenty years ago, this was the thing to do…but in the 2000’s with minimum wage unable to sustain the cost of living, students are looking for ways to pay for school that aren’t leaving them in hundreds of thousands of dollars of debt. With the ever-rising cost of education, scholarships have become the only viable option for many students to get a quality education without paying a gruesome price for it. 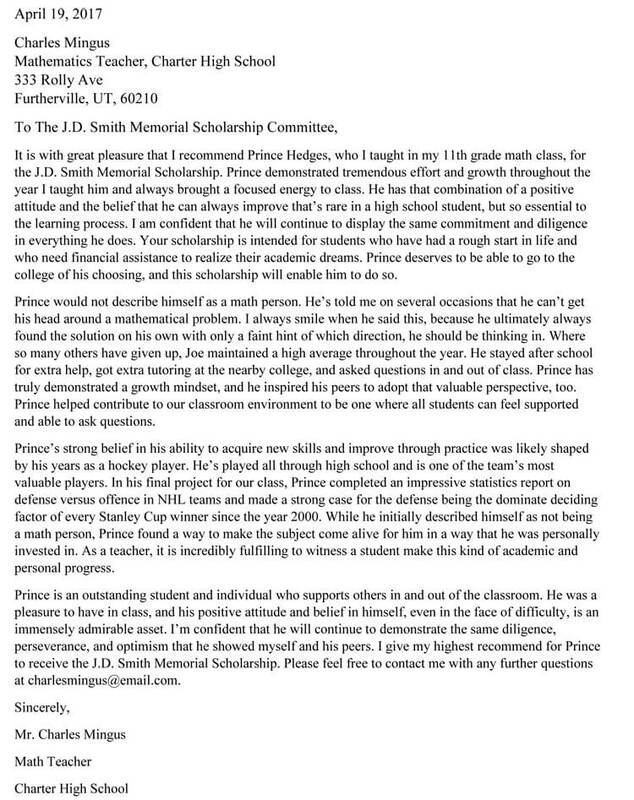 But, what is a scholarship? What do you need to get one? 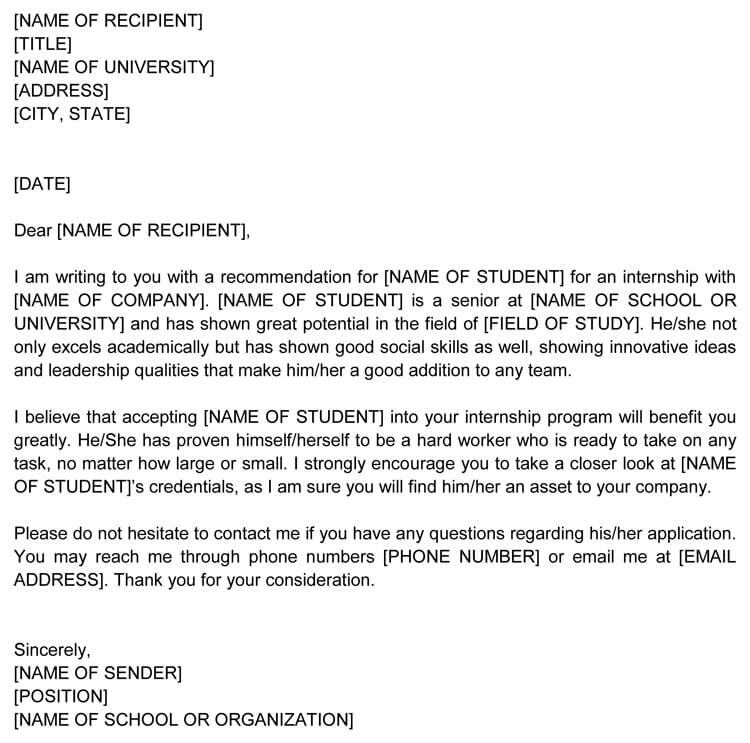 And what is this dreaded letter of recommendation? 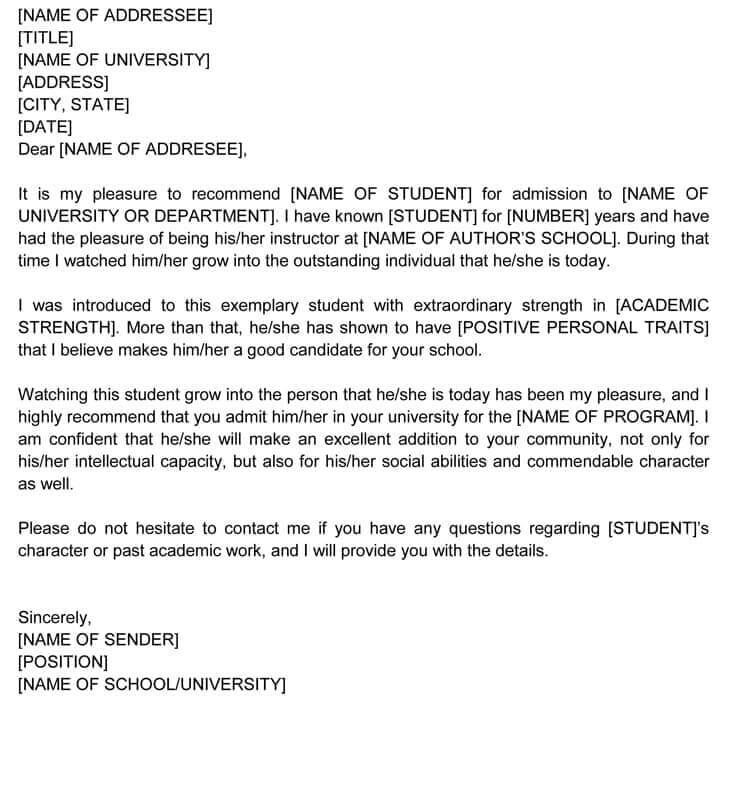 How to Write Scholarship Recommendation Letter? 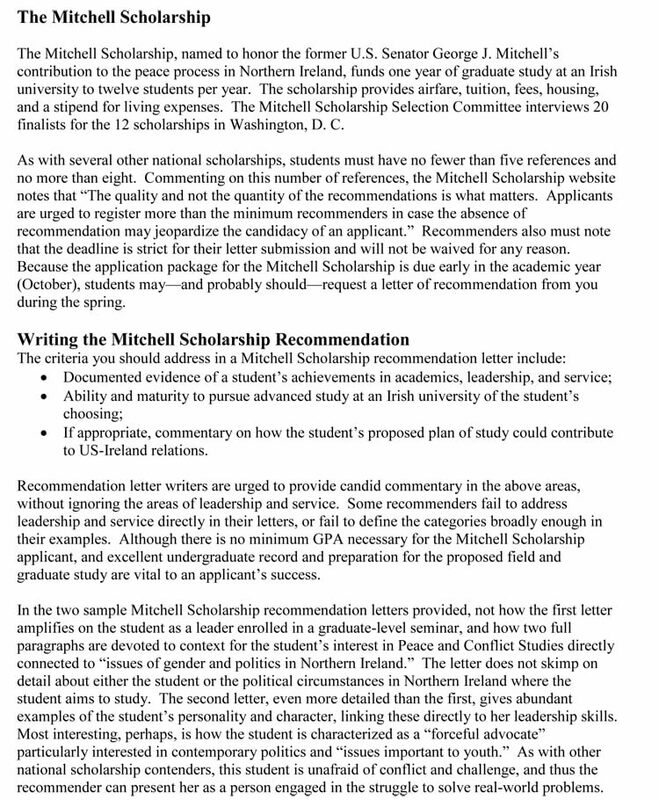 What Scholarship Admin Looks for in Your Letter? This is a question that most students don’t understand going into the application process and that’s ok! 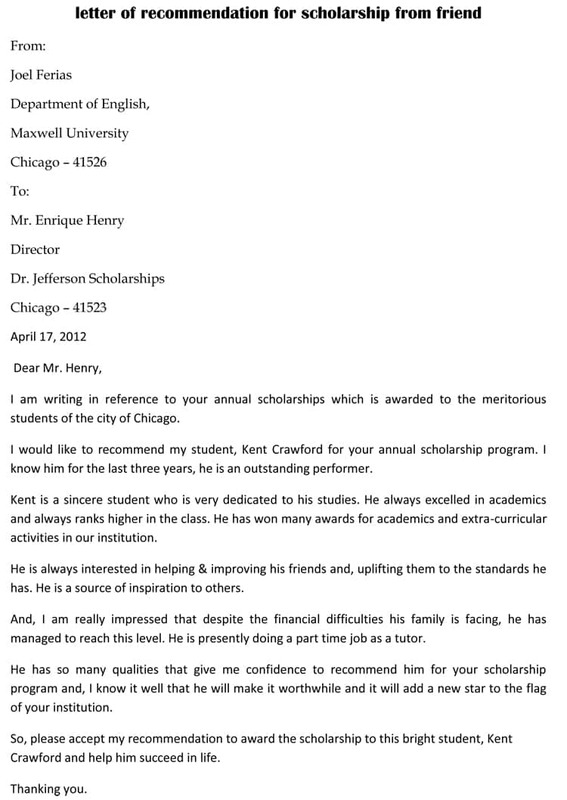 A scholarship is an award of financial aid given to students to further their education. Scholarships range from the serious, such as students who have a large financial need, to the ridiculous, such as financial awards for students who own specific pets. They are a wonderful way for students to reduce their financial responsibility and debt upon graduating college, often being referred to as “Free Money” by students because some scholarships are easy to get. Scholarships can finance years of education or even study abroad opportunities. 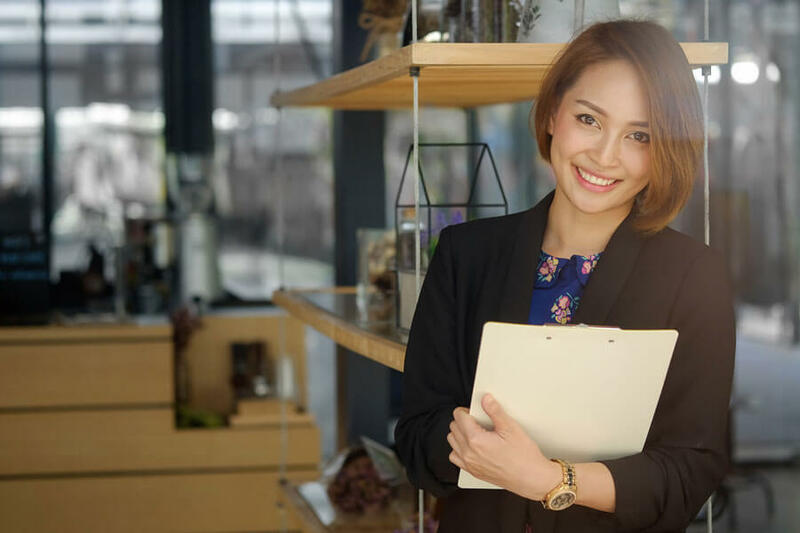 No matter what kind of scholarship you are applying for, attaining one allows you to rest easy, knowing that you have lessened your financial burden. 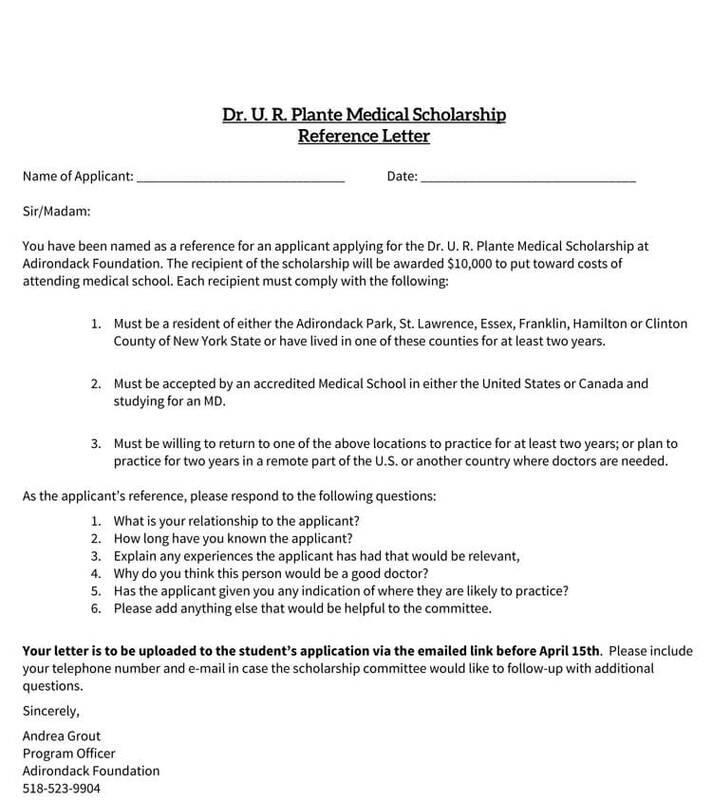 Applications for scholarships can be found on a variety of websites and, often, your school can direct you to local opportunities to earn scholarships. Some schools even have counselors that will be more than happy to help walk you through the application process for scholarships. 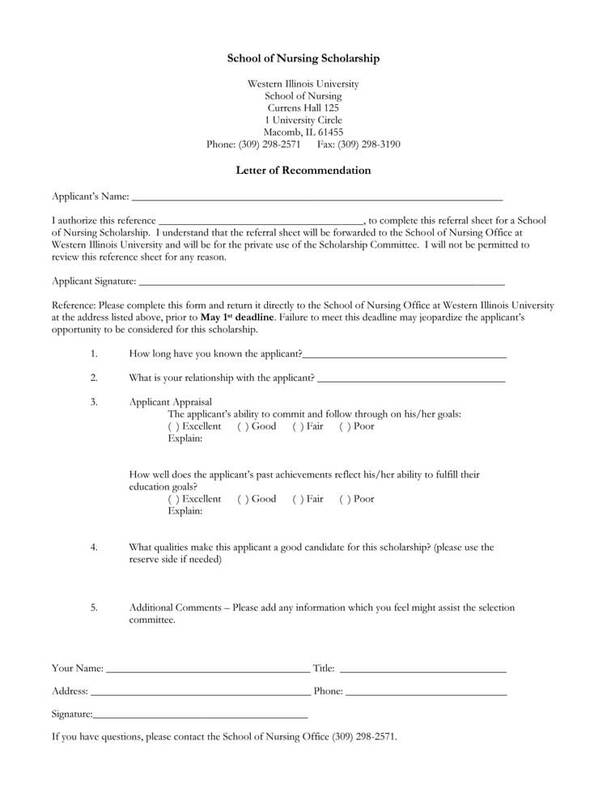 Some universities even use your college application to determine your eligibility for scholarships directly from the university! The opportunities for scholarships are endless! You just have to look! 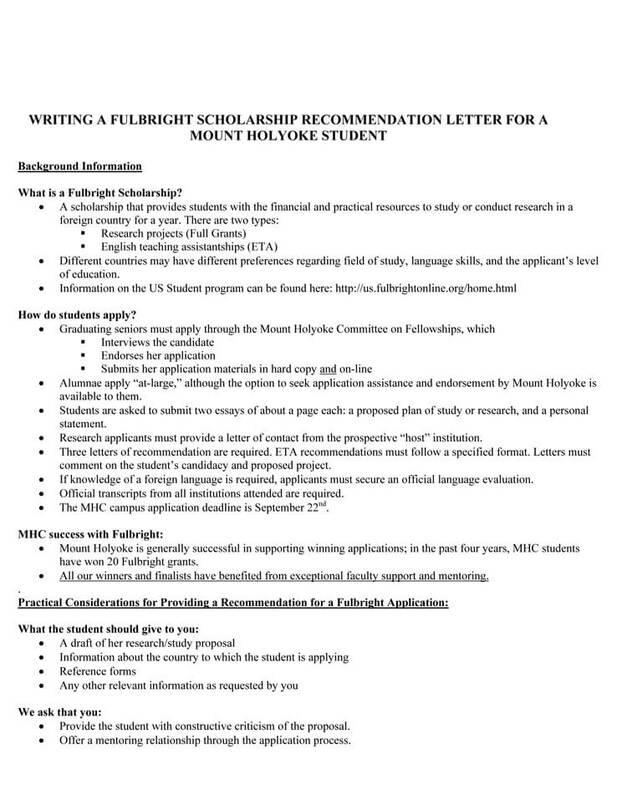 All scholarships have different requirements for the application process. 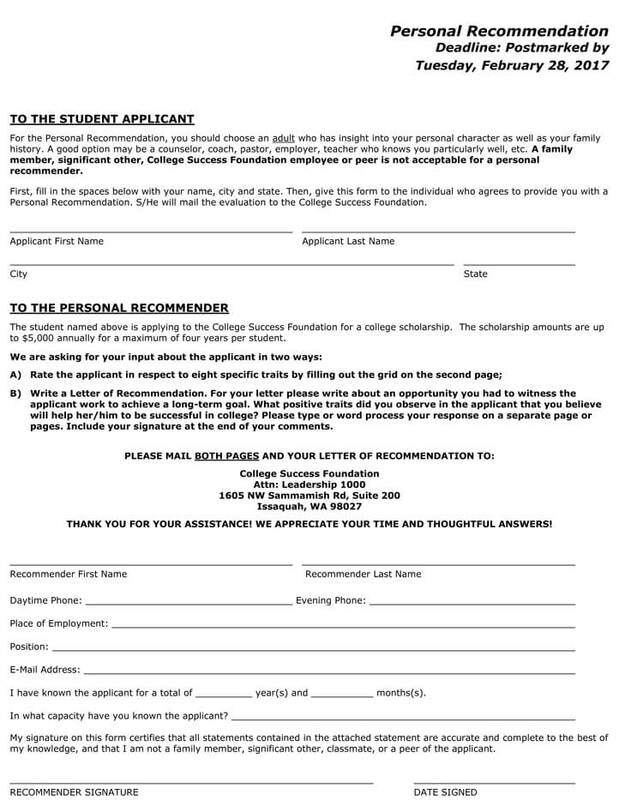 For the majority of scholarships, you will need a letter of recommendation. 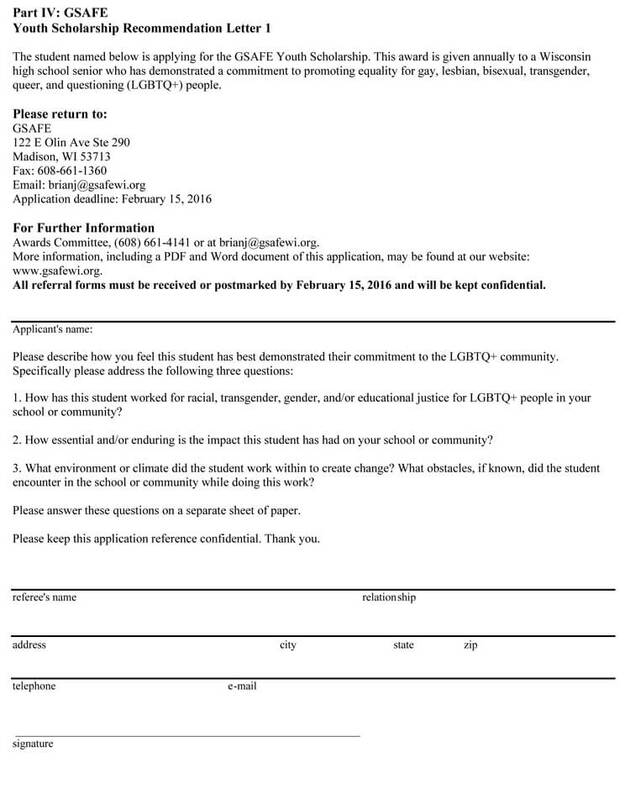 These letters are usually written by a teacher or other adult mentor who can give a good overall picture of you as a student and your character as a person. These are essential to attach, even when not asked for to provide the committee deciding on scholarship recipients a basis to set you apart from the rest of the crowd. 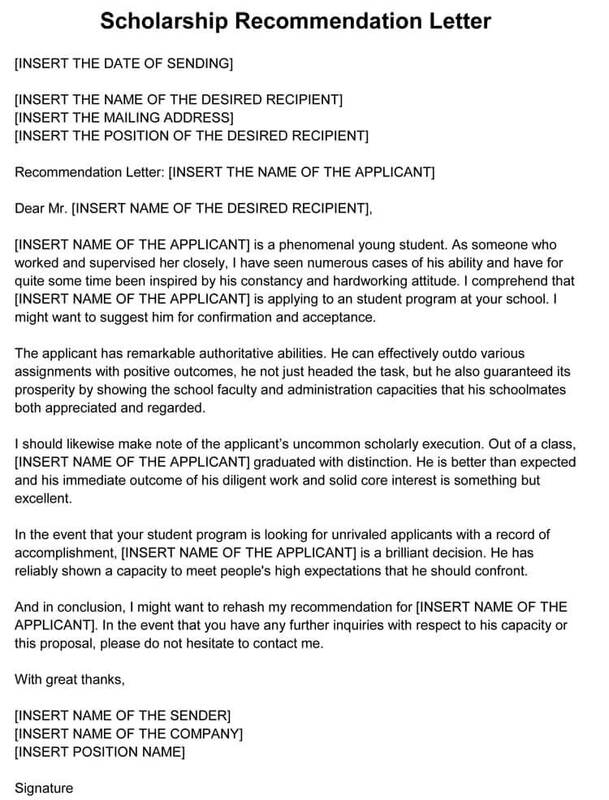 When asked for a letter of recommendation, a lot of students get intimidated. 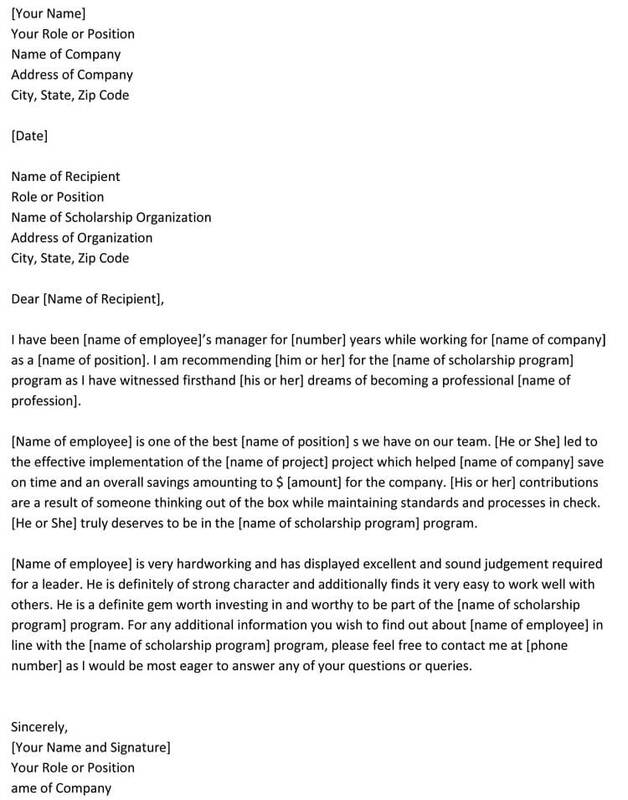 But, letters of recommendation allow a scholarship committee to look into the depth of your qualifications for specific scholarships and to get a better picture of why you are truly deserving of their money. For this committee, a scholarship is an investment and they want to make sure that you are a good return on that investment. 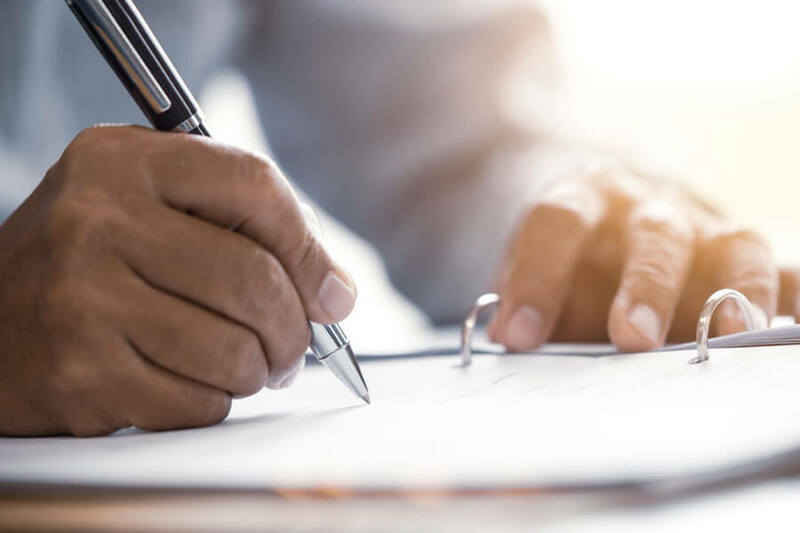 All letters of recommendation have different requirements, so make sure that you read your application fully to see if they want you to make sure specific things are covered. 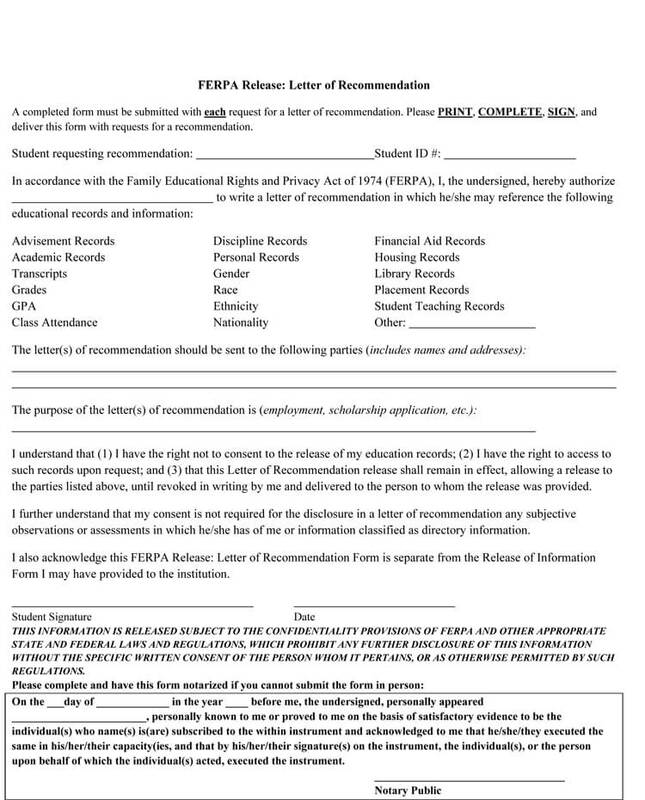 Sometimes, a recommendation can even be in the form of a questionnaire that they ask you to have someone fill out. 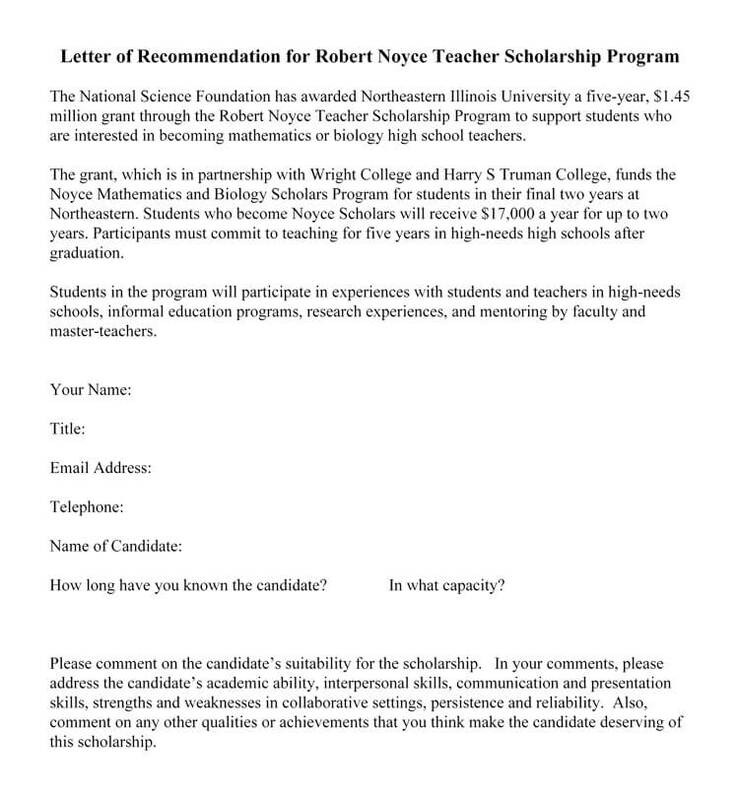 Other times, they truly want your teacher to write a letter of recommendation from scratch. Teachers do this all the time for their students, especially those that teacher secondary grades and they are familiar with being asked to do so. Don’t be shy asking them! 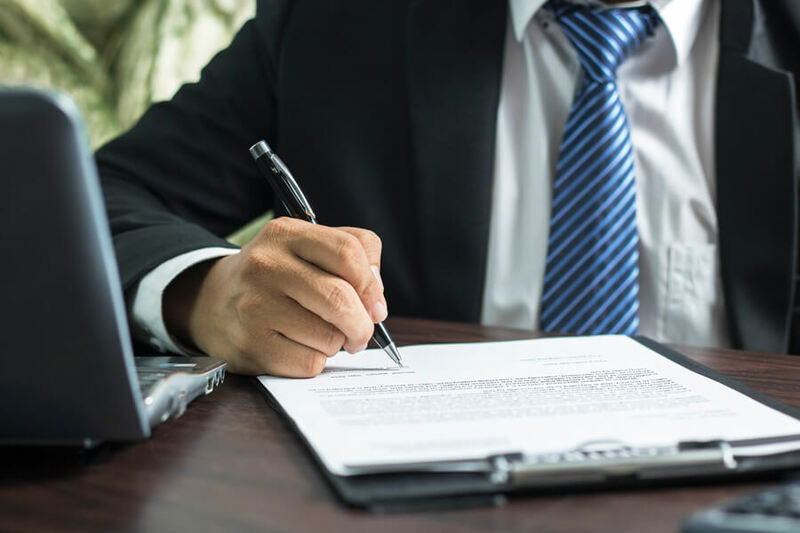 Now that you know you need a letter of recommendation, you’re probably asking, “What do I need to make sure is in a good letter?” This can be tricky, especially if you’re the one asking for the letter and not the one writing the letter. 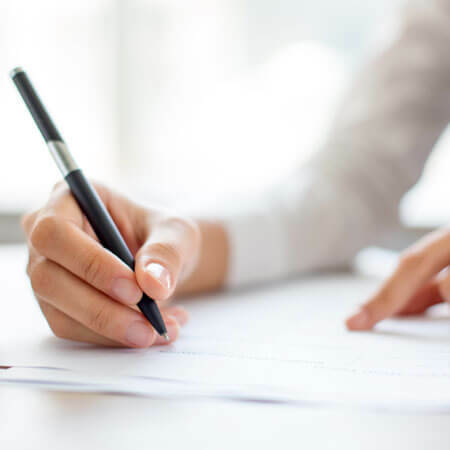 If you’re the one asking for the letter, here are a few important things to consider before you even have the letter in your hands. Am I asking the most appropriate person to write this letter? Am I giving them enough time to finish this letter? Should I write the letter for this person and ask them to sign it? (If you go this route, make sure that you talk to the person in advance and that you write a realistic letter, if they agree. 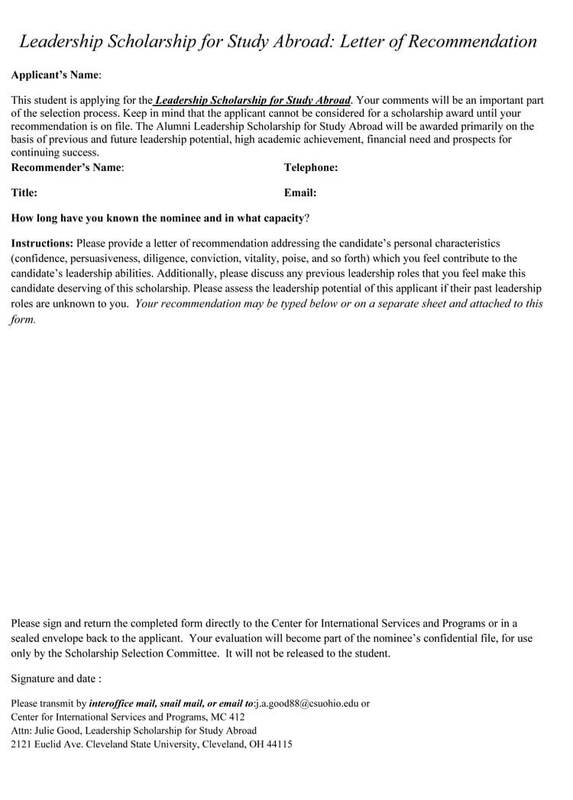 Scholarship committees will sometimes call a recommender if they need more information, so this route it good in a pinch, but not advisable. 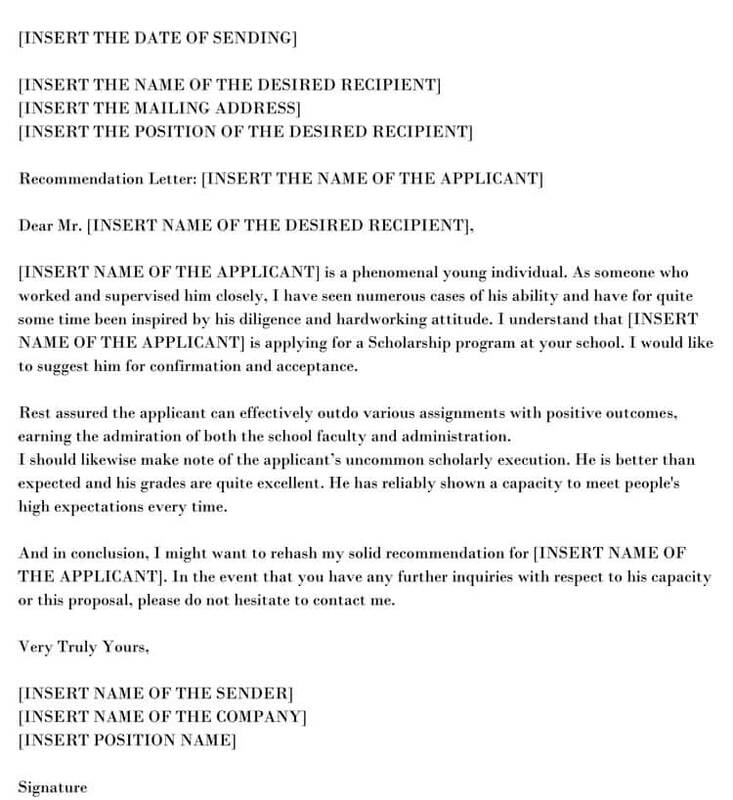 If your letter includes all of the above points, you have a rather strong letter of recommendation that will cause the committee to take a good look at you as a candidate. 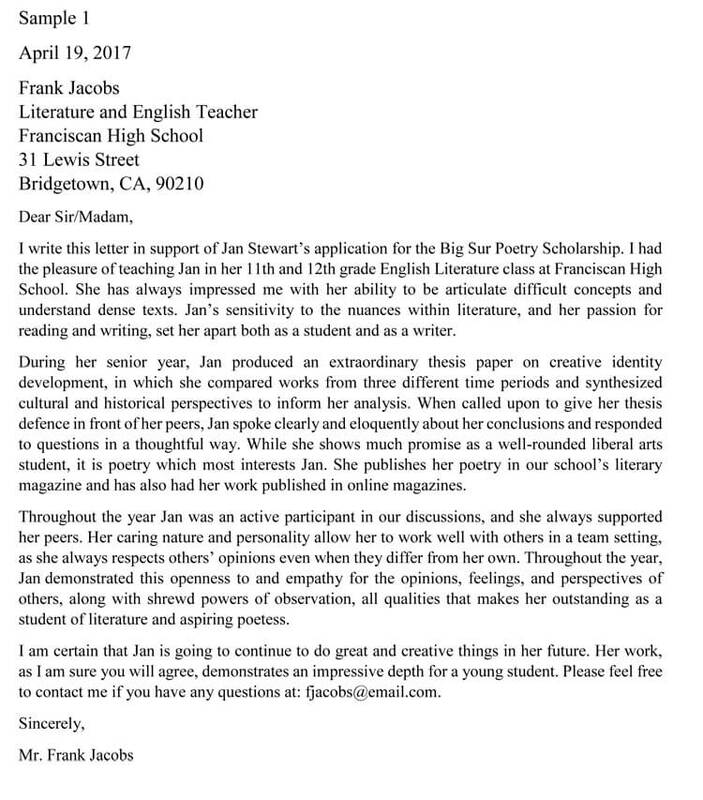 I write this letter in support of Petra Lambert’s application for the William Shakespeare Poetry Scholarship. I had the pleasure of teaching for her 10th, 11th and 12th grade English Literature and Composition classes at Nevermore High School. She has always impressed me with her ability to articulate difficult concepts and understand dense texts. Her sensitivity to the nuances within literature, and her passion for reading and writing, set her apart both as a student and as a writer. During her senior year, Petra produced an extraordinary research paper on historical literature, in which she compared works from three different time periods and synthesized cultural and historical perspectives to inform her analysis. When called upon to give her presentation in front of her peers, she spoke clearly and thoughtfully, responding to all questions from her peers in an informed manner. While she shows much promise as a student, it is poetry which most interests her. She publishes her poetry in our school’s newspaper and has also had her work published in online journals and blogs. Throughout the year Petra was an active participant in our discussions, and she always supported her peers. Her caring nature and personality allows her to work well in a team, as she always respects the opinions of others. She uses this openness to affect her poetry and to create informed pieces of literature. I am certain that she will continue to do great and creative things in her future. Her work, as I am sure you will agree, demonstrates an impressive depth for someone so young. Please feel free to contact me if you have any questions at: vjones@email.com. 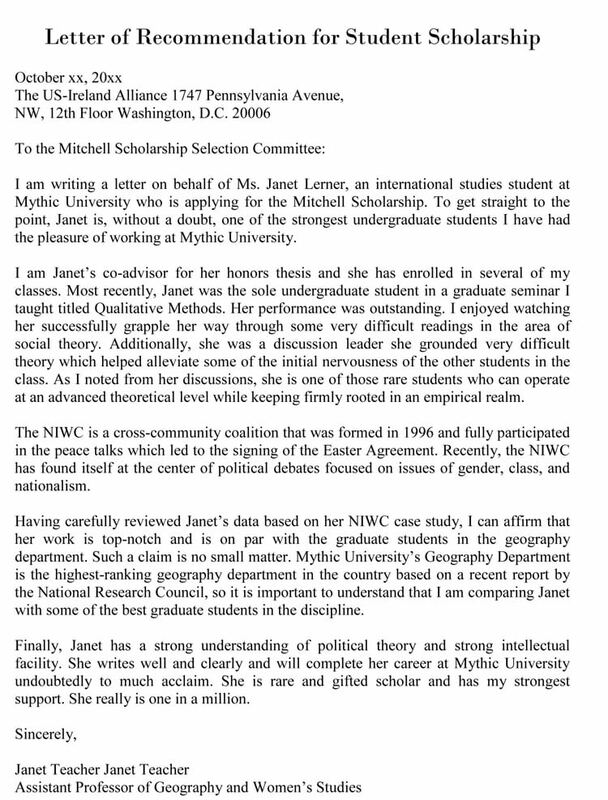 I am writing this letter to recommend Petra Lambert for the Night Owl Scholarship with Phi Delta Phi. I was her 12th grade Childhood Development teacher and have known her for the last four years. As a student, Ms. Lambert demonstrated a love of learning and the level of commitment necessary to succeed in college and beyond. 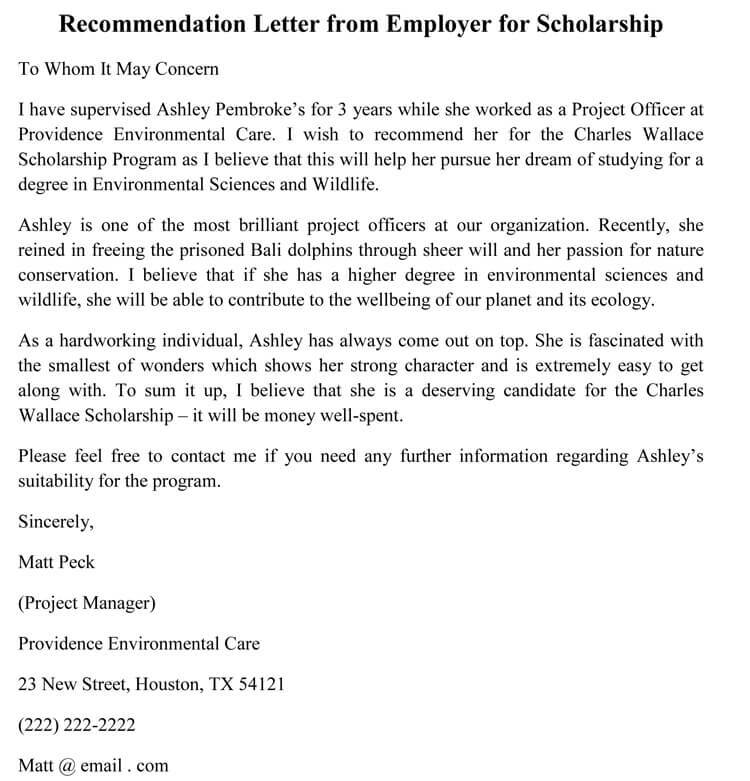 As an educator, I am happy to be able to provide this recommendation for such a deserving student who has inspired so many others with her volunteer work with children. I have great respect for her abilities and truly believe that she is a deserving candidate that you will be proud to have representing your fraternity of educators. Ms. Lambert is an excellent student who has achieved all A’s this year, making her a School Board Scholar for the 2018-2019 School Year. She volunteers with students once a week, tutoring with our elementary schools. Petra is an incredibly motivated student and even attends lectures on education on the weekends when she is able. In addition to having firsthand knowledge of her academic commitment, I am also familiar with her educational goals, as well as the challenges she will face when it comes to funding college tuition. I cannot think of anyone more deserving and I can wholeheartedly recommend her application. I feel certain that you will be just as impressed with Petra as the staff at Nevermore High School has been over the past four years. 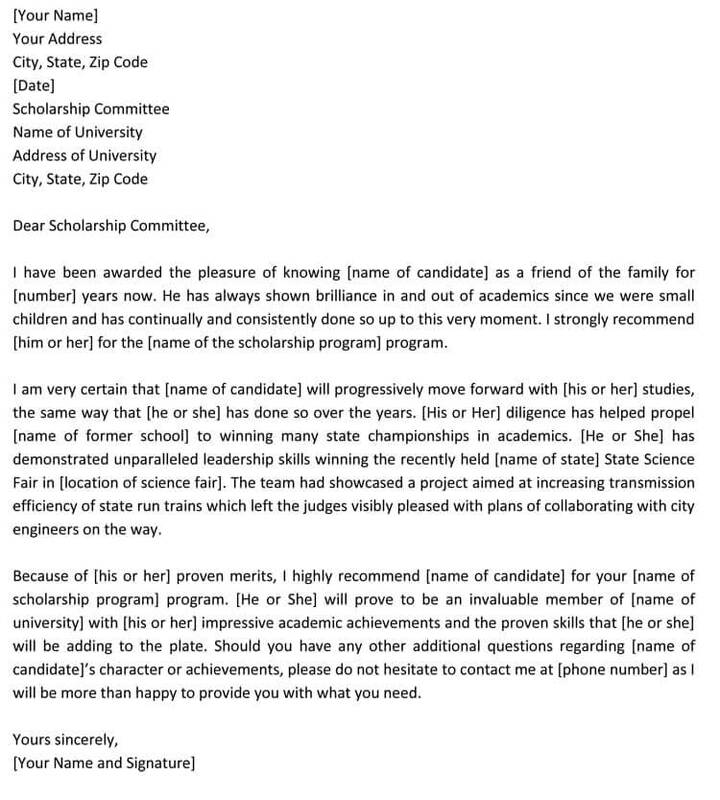 I strongly encourage you to consider her for this scholarship. 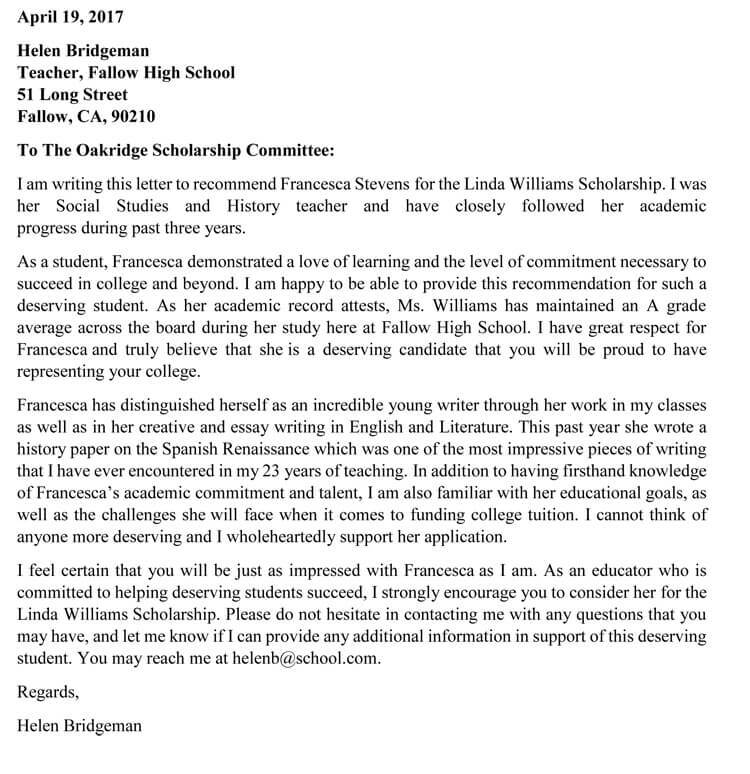 Please contact me with any questions and let me know if I can provide any additional information in support of this deserving student. 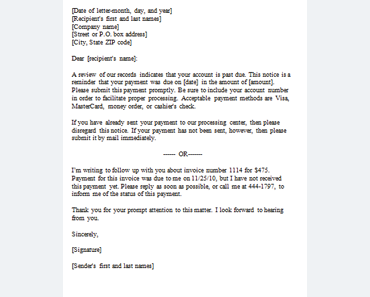 You may reach me at 555-555-5555 or vjones@email.com. This question is always a tricky one for the authors of letters. The simple answer is, “yes”. 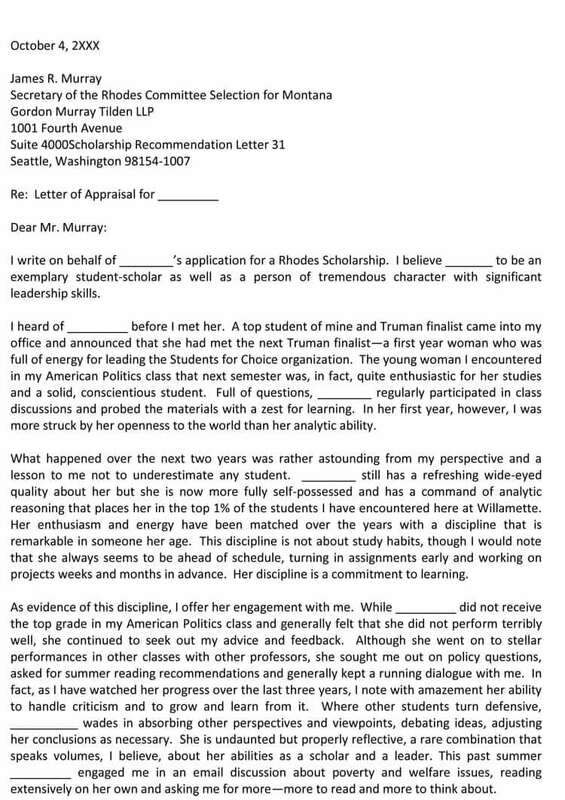 If you are writing a recommendation for a student and you have nothing nice to say, you probably shouldn’t be the person writing the letter! Only include positive things about your student. Avoid talking about discipline problems, especially. These can keep students from getting a scholarship. Do not divulge private information about the student, unless you need to for the sake of the scholarship. You don’t need to overshare. 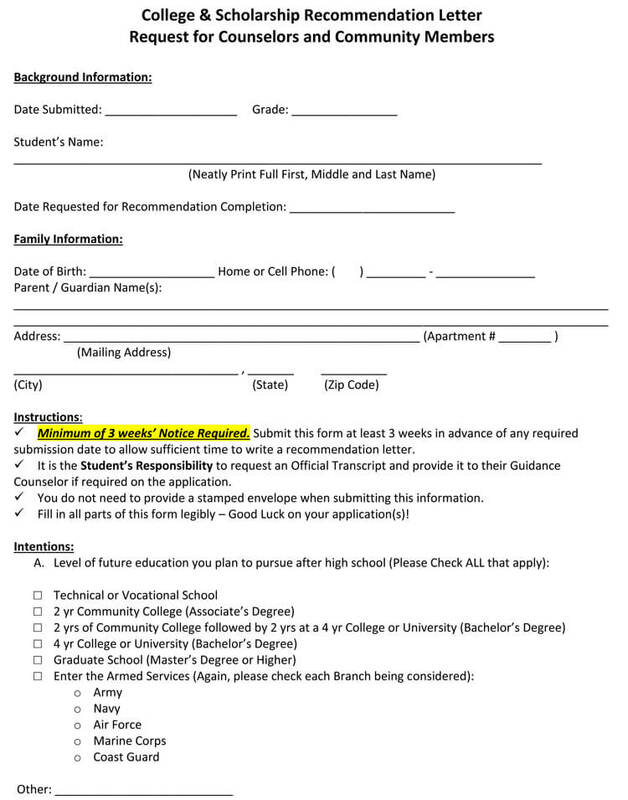 If your student overcame the challenge of losing a parent, for instance, do your best not to bring this up in your letter unless it is pertinent to the scholarship or you have the permission of the student. The scholarship committee isn’t looking to buy a story: they want to know all of the wonderful things about your student! 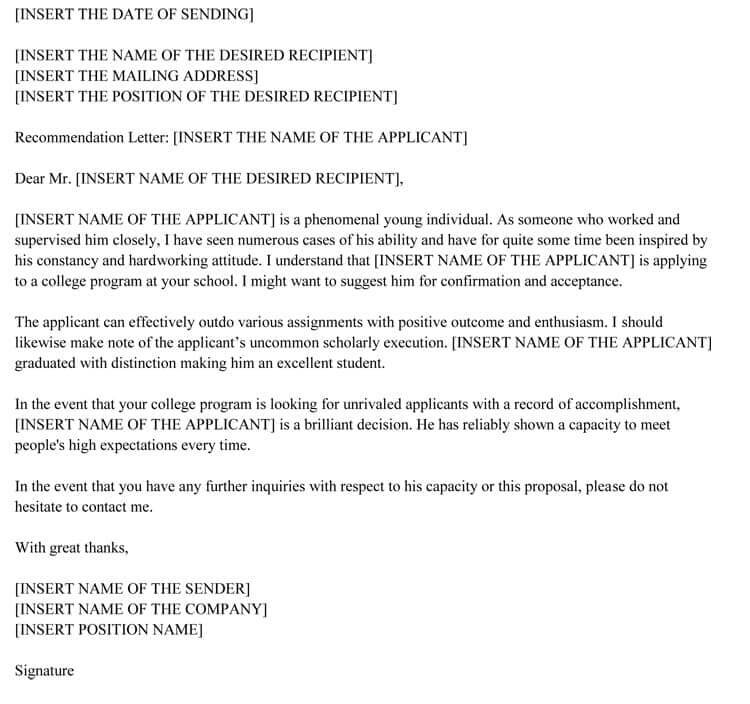 Struggles of the student: Do not include things that your student struggles with in your letter of recommendation. These can be seen as negative and can cost a student the scholarship. Make sure that you do not accidentally include things that you might view are opportunities or weaknesses of the student. If you avoid using these three non-negotiables and stick to the parameters of the scholarship, you should be on the right track to helping your student earn a scholarship! 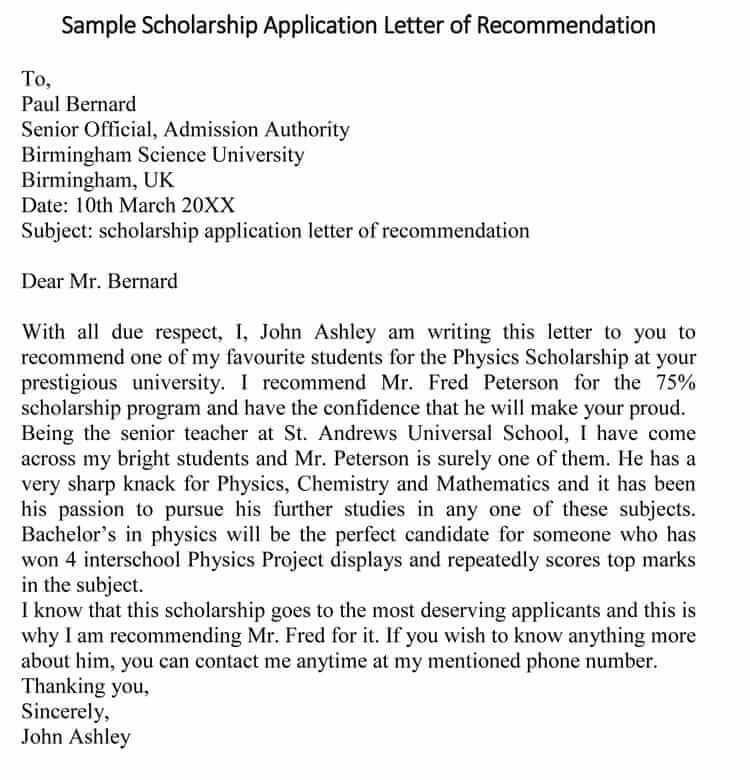 Writing letters of recommendation is never an easy task. 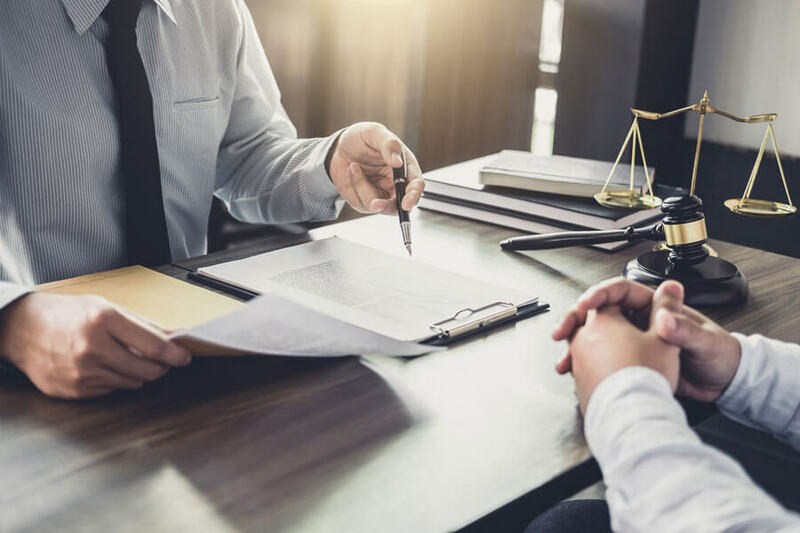 As long as you follow the guidelines set in this article, you are well on your way to writing a perfect letter of recommendation. Professionalism: Was your letter delivered on-time? 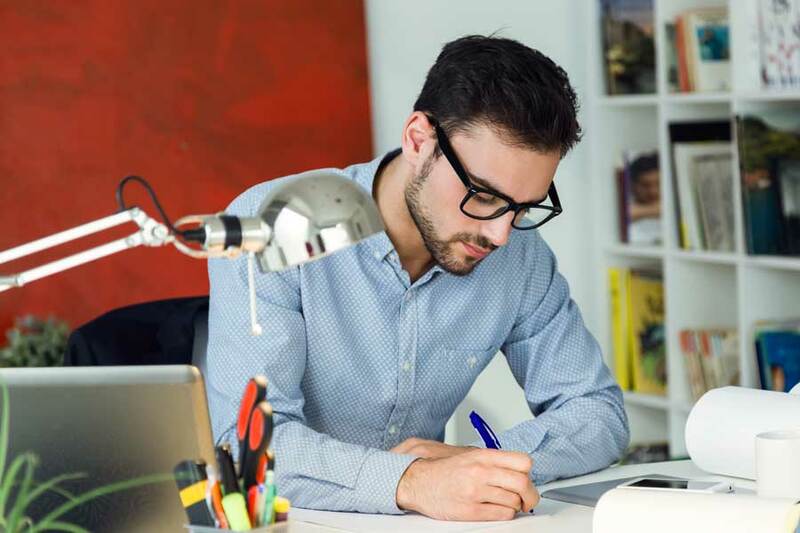 Is the writing professional? 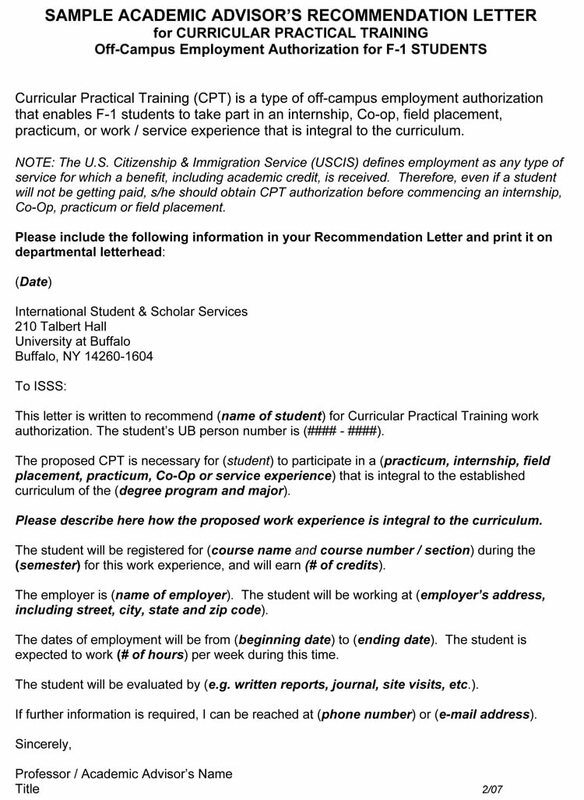 Does it cover the requirements for the scholarship? Who wrote your letter? 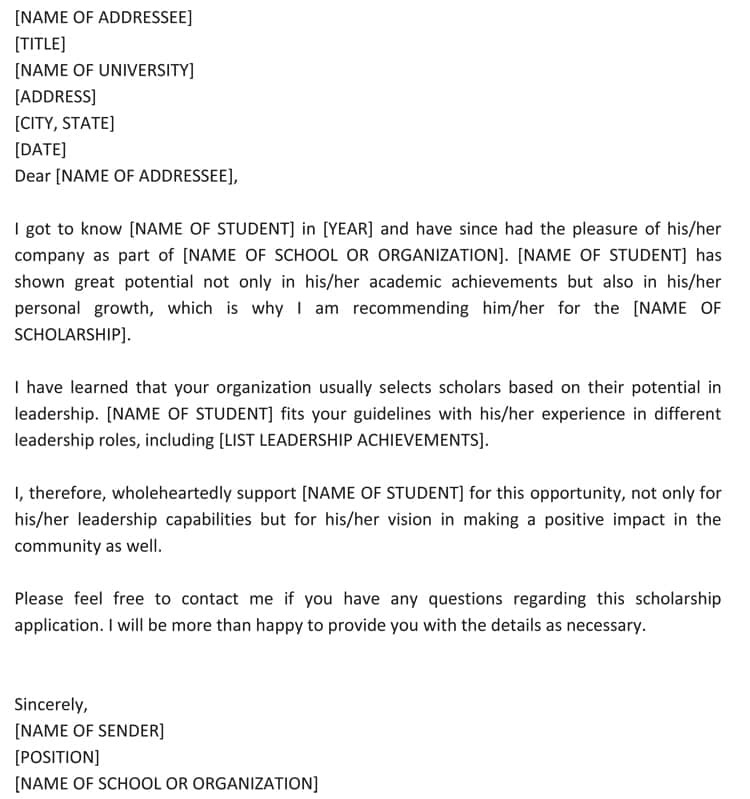 : Was your letter written by someone who can speak to your specific requirements for the scholarship? Or did you choose someone that doesn’t quite meet the criteria for the committee? A teacher, coach, scout leader, or other adult figure of authority will generally pass this test. 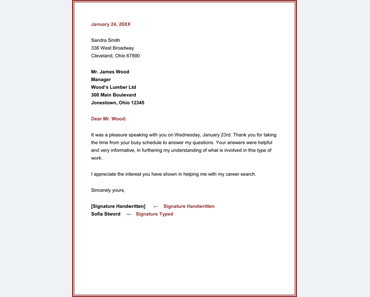 Letterhead: What kind of paper was your letter written on? 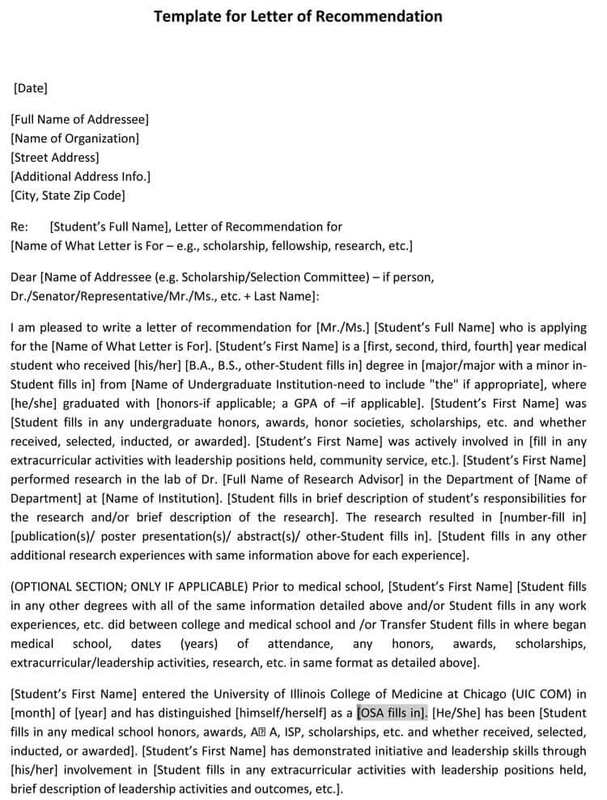 A lot of scholarship committees like the letter to be written on official, professional letterhead. 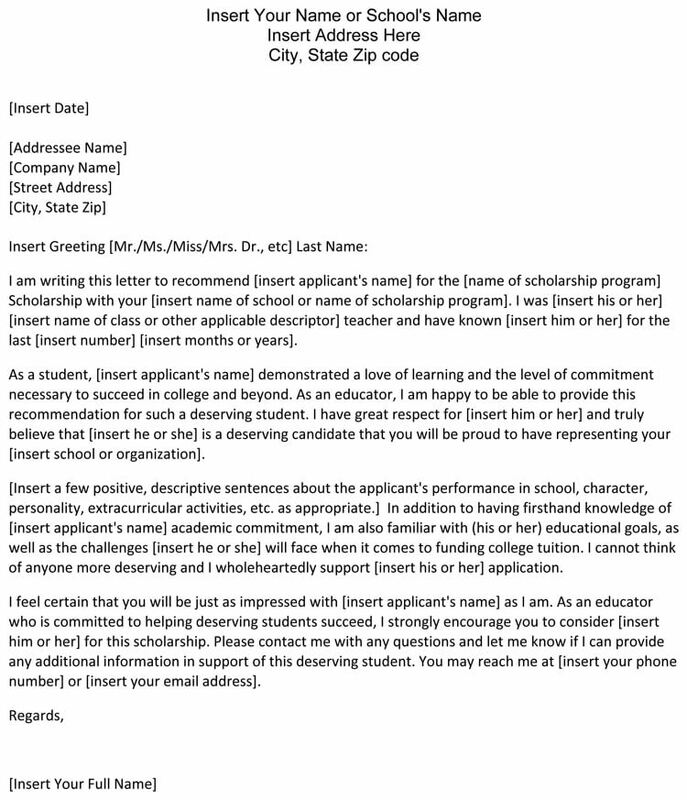 If you ask a teacher, most schools have letterhead that their employees use to write letters of recommendation. If it is a scout leader, ask them if they have letterhead from the organization they work with. While letterhead isn’t required, it does make your letter appear more impressive. 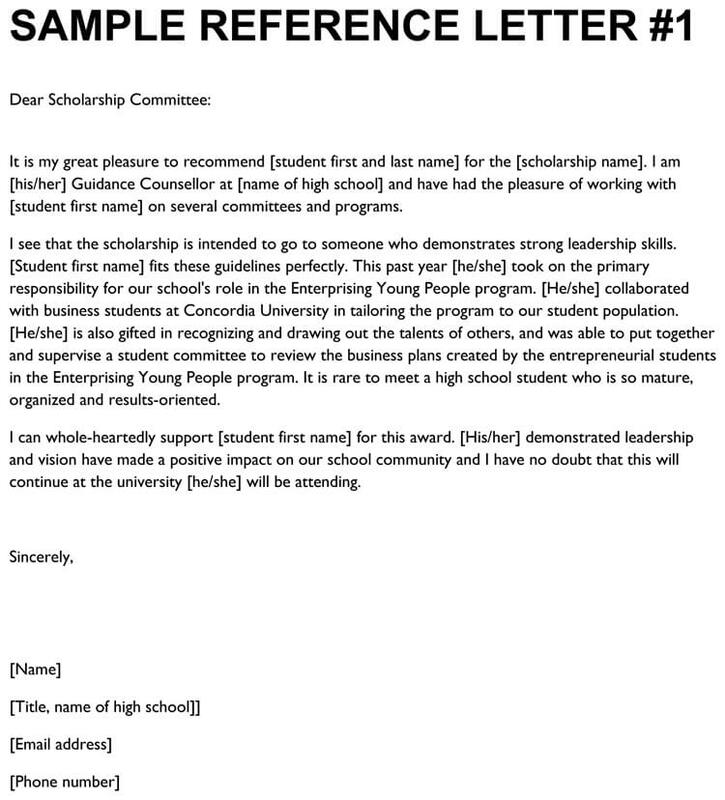 Your accomplishments: Did your letter include impressive accomplishments from your time in school? Bragging about yourself is never easy, but, in this case, it is worth it. 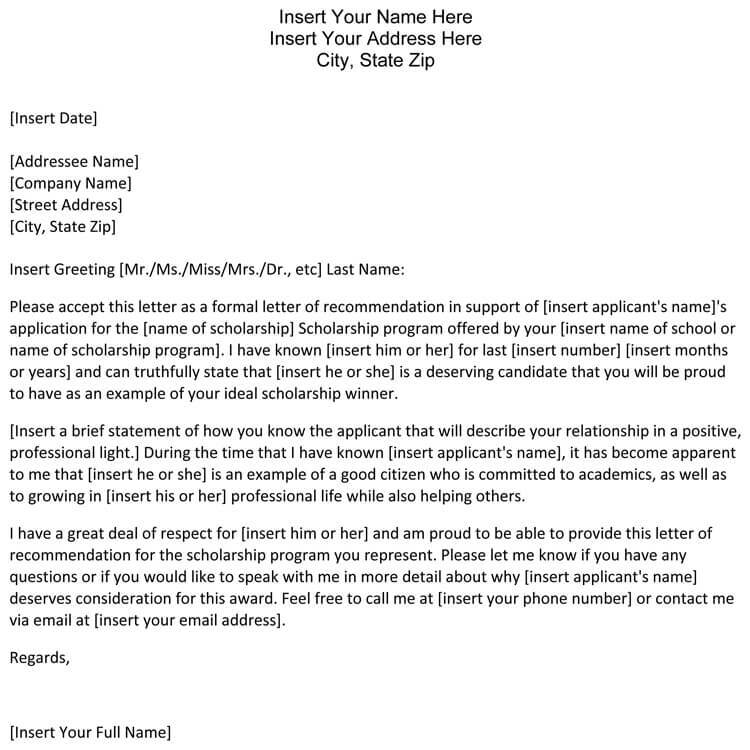 Make sure to tell the person writing the letter some of your accomplishments. It’s never too early to begin drafting your resume to list these, either! Length: Follow the “Keep It Simple” method with letters of recommendation. 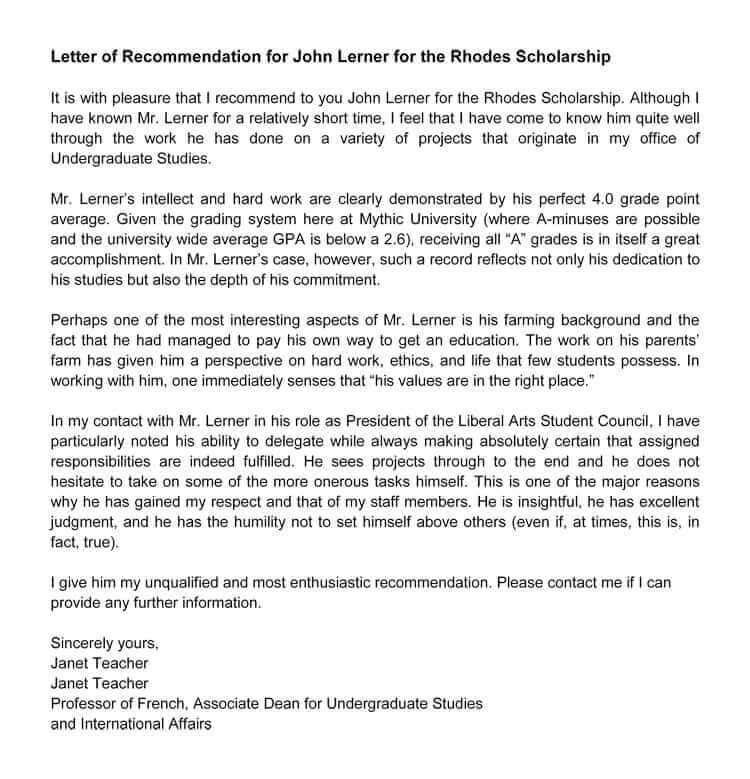 It is rare that a letter of recommendation ever goes over a page. And, if it does, do your best to shorten it to a one page length. 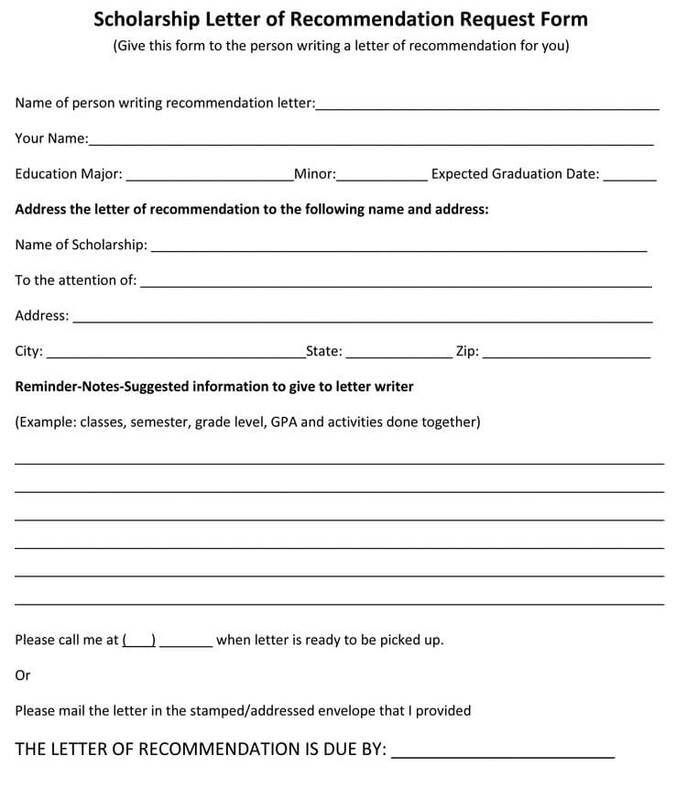 Scholarship committees have a lot of applicants to get through and you want to make sure they have time to devote to your entire letter. When scholarship officers read letters that include these five things, your application is more likely to get moved to the top of the pile.